work has started across Nottingham on the biggest council-home building programme since the 1960s – and the first tenants have now moved into their brand new homes in Bestwood and Aspley which were completed by Nottinghamshire construction contractor Robert Woodhead Limited. The Contractors recorded a series of short videos about the construction of the new homes. Click here to see the project. Nottingham City Council (NCC) and Nottingham City Homes (NCH) are working in partnership over the next five years to transform Nottingham’s neighbourhoods. Work started last year on the first phase of the programme, which includes 26 properties built on four disused garage sites across the city. This £2.85m phase is being carried out by Robert Woodhead. Four bungalows at Geraldine Close in Bestwood and two bungalows at Keverne Close in Aspley, have now been completed. Two further sites at Windmill Close in Sneinton and Henning Gardens in Top Valley are expected to be completed by the end of the year. Hanson and Elaine Stowe, formerly of Top Valley, have just moved into their home on Geraldine Close and they couldn’t be happier. Seventy-two-year-old, Hanson, said: “We’re not getting any younger and this area is so peaceful it’s wonderful. We have moved from a three bedroom house as we were wanting a bungalow, but this is just perfect, we couldn’t have asked for more. “With all the solar panels and the insulation, we have a comfortable warm home and we’ll be saving a lot on our energy bills. Councillor Alex Ball, Executive Assistant with responsibility for Housing and Regeneration, said: “We believe this council home building programme is the largest scheme in the country for the past few decades. We are working to transform Nottingham’s neighbourhoods, removing the properties that are no longer fit for purpose and replacing them with new, sustainable, energy efficient properties. Nick Murphy, Chief Executive of Nottingham City Homes, said: “We are committed to creating homes and places where people want to live, and we’re proud to be delivering the biggest council home building programme Nottingham has seen since the sixties. “There’s a mix of properties across the whole programme, from much-needed family accommodation to bungalows and independent living schemes. 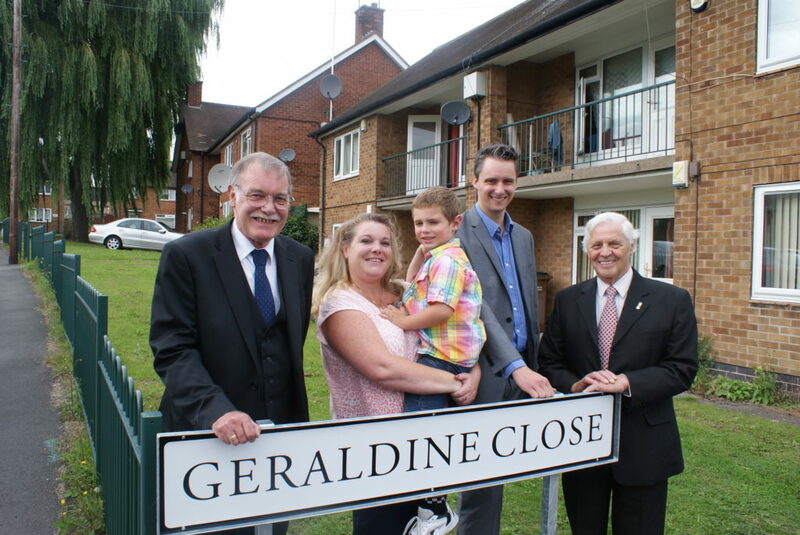 Geraldine Close has been named after the late Gerry Sharp, who was the driving force behind the Cherry Trees sheltered housing development, which is just around the corner from the new road. Gerry was one of the senior officers responsible for both the Cherry Trees and Hazel Hill accommodation, and it’s a testament to her local popularity and the work she put in to caring for the community, that the road has been named after her. Three generations of Gerry’s family will be attending the event to officially cut the ribbon on the new properties and share their stories about Gerry and her life and work in Bestwood. Pictured: Gerry’s family officially open the Close.